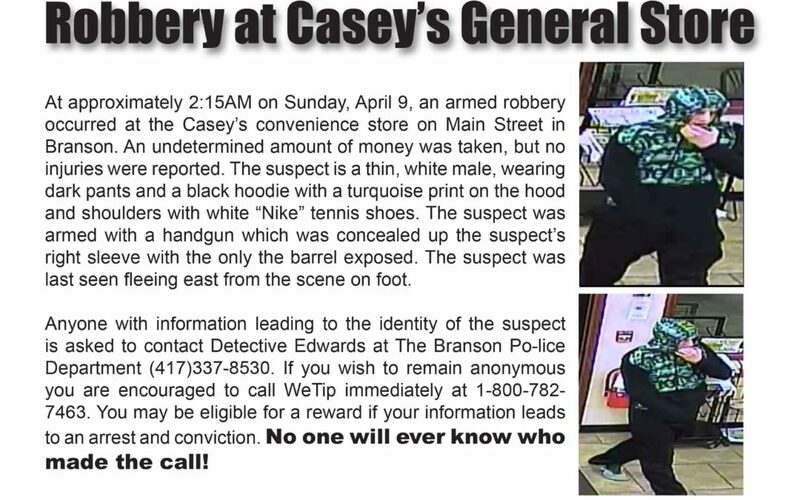 Robbery: Seeking Suspect | WeTip, Inc.
At approximately 2:15AM on Sunday, April 9, an armed robbery occurred at the Casey’s convenience store on Main Street in Branson. An undetermined amount of money was taken, but no injuries were reported. 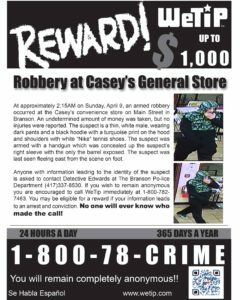 The suspect is a thin, white male, wearing dark pants and a black hoodie with a turquoise print on the hood and shoulders with white “Nike” tennis shoes. The suspect was armed with a handgun which was concealed up the suspect’s right sleeve with the only the barrel exposed. The suspect was last seen fleeing east from the scene on foot.